Here are the pictures I promised. The speakers are very transparent and revealing. Waltz for Debby by Bill Evans is amazing in terms of sound stage, it is like you are there at the performance. On other records you get what is on the record, which for most of my rock collection is not much, Led Zepplin I is just dreadful sounding, but no speaker will make a bad recording sound good. 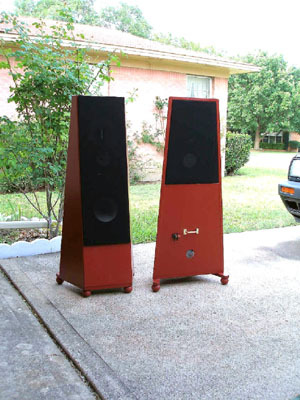 I agree with you regarding the technicolor ProAc sound, it is spectacular, but perhaps hard to live with long term, these speakers do not enhance to sound in that way but rather have an honest presentation of what is on the recording. 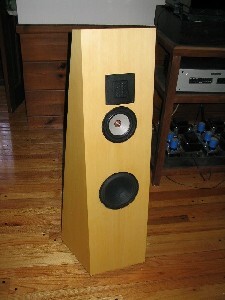 The speaker are veneered with Alaskan yellow cedar and use solen and clarity caps and coils from Meniscus Audio. In addition to the foam liner I also stuffed the cabinets with sound absorbing material. This seems to have suppressed the bass somewhat and I will probably remove some or all of the stuffing. Thanks again for the great material you have provided on the web. 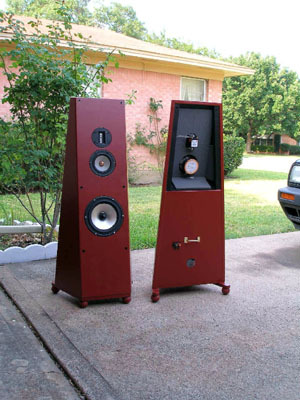 My parts cost on the project was approximately $900 USD and I feel like I have the equivalent of a $5,000 to $10,000 commercial speaker. 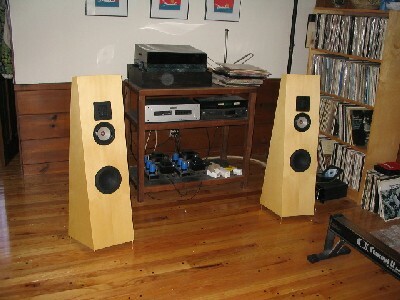 They are a vast improvement on the Spica TC-50 two way speakers I was previously using. The amps are Quicksilver Silver Monos (90W) and I recently purchased SP16 with phono stage to replace my Quicksilver preamp with phono, which sounded gritty and flat in comparison to the ARC, for the money I thought it was a good deal, especially since it included the phono stage. I use a quicksilver step-up transformer for the phono and I am using a modified Well Tempered turntable (Two piece green marble plinth set in a sand box on top of tennis balls) and a Benz glider cartrige. All the wire is MIT Tube Terminator. I currently have a cheap NAD CD player and I am looking for a cost effective quality player.